The Centre for the Study of Resilience (CSR), Faculty of Education, University of Pretoria, and RAN Southern Africa Resilience Innovation Lab (SA RILab) (funded by USAID) recently co-hosted the 5th event in the Dialogue and Ideas Lab Series on Resilience Research, titled “Building resilience communities: Science dialogue for resilience in challenged contexts”. This event took place at the Protea Manor Hotel on the 3 rd November 2016. Eighteen presentations shared transdisciplinary, evidence-based findings in terms of five pathways to resilience, psychological, livelihood, socio-cultural, environmental, as well as education pathways to resilience. 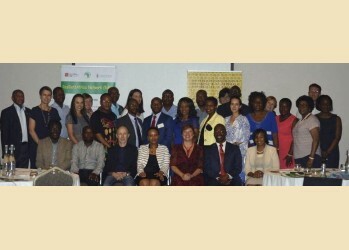 Attendees included representatives from and academic institutions (University of Pretoria, North-West University, Lilongwe University of Agriculture and Natural Resources and University of Limpopo), government (CSIR Meraka Institute,), NGO’s (World Food Programme and World Vision) and funding agencies (USAID). Cross-cutting transdisciplinary resilience themes were evident to address adversity synonymous with a postcolonial, global south settings. Common resilience pathways included social support from significant relationships on family and community level; aspiration (individual and community level); as well as investment in quality and accessible infrastructure. In addition it was apparent across disciplinary findings that human capital development and political action was indicated as pathways to move from coping with structural disparity to changing the odds of inequality. For more information on the presenters and presentation titles, click here.